tags: choosemyplate.gov, health benefits of vegetables, What is MyPlate? The final day of [NL]’s “MyPlate Week” is devoted to the vegetable group. Mom always made you finish your vegetables at the dinner table and you should be glad she did! Eating vegetables provides us with numerous health benefits and have been linked to reduced risk of chronic disease. Not only that, but contrary to popular thought, vegetables CAN taste good. Below are some reasons why vegetables are an important element of your everyday plate. Eating a vegetable-rich diet may help to reduce the risk of cardiovascular disease, type 2 diabetes, stroke, obesity, and some cancers. Because they are often high in potassium, they may serve to help lower blood pressure as well as reduce the risk of developing kidney stones. Additionally, vegetables are lower in calories than other high-calorie foods, which are known as nutrient density, and they can be helpful in lowering calorie intake for weight loss. Be Bright: The brighter orange and red vegetables are packed with antioxidants and include acorn squash, carrots, red peppers, sweet potatoes, and tomatoes. Freezing Frenzy: Stock up on frozen vegetables for quick and easy cooking in the microwave. Go Green: Dark green vegetables are delicious and often filled with folate and iron. Enjoy broccoli, collard greens, mustard greens, spinach, and turnip greens. Properly Plan: Plan meals around vegetables such as stir-fry or soup. Then add other foods to complement the veggies. Savor the Starches: Vegetables in the “starch” group can be nutritious and filling and include corn, green peas, lima beans, potatoes, water chestnuts and cassava. Vary Veggies: Keep you vegetables varied by including different colors, shapes and sizes for each meal. Have fun with it. Because children often prefer foods separately, try separating two vegetables rather than mixing together. Remember to always set a good example when eating vegetables with your kids! 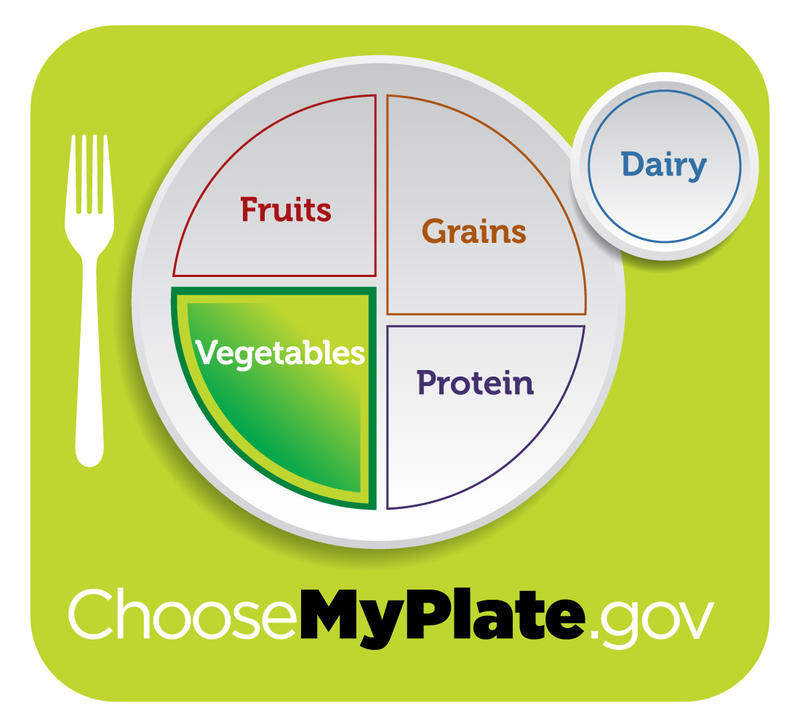 For more info on fruits and all of the other food groups represented on MyPlate, check out choosemyplate.gov. Great tips on implementing MyPlate. I like the way you are diving into each section of the plate separately. Thank you Tammy! ‘MyPlate Week’ was a success for us at [NL] and we were happy to discuss the new model for healthy eating in the US. How do you feel about the new USDA food icon?